formerly known as "STATE RICH INDUSTRIES LIMITED "
was established in 1987. Starting from the production of Wooden Air Outlet to the mass production of variety of diffusers. After 20+ years efforts, strive for excellence , we have gained remarkable achievements in the Air-Conditioning field. Due to the implementation of Chinese economic reform and the increasing needs of market, we expanded our business to China and registered “STATE RICH VENTILATING EQUIPMENT (SHENZHEN) COMPANY LIMITED” in 1991. We setup a 2,000+ square meters workshop located in ShenZhen with advanced equipments and technology from U.S., Germany, Japan, Taiwan. 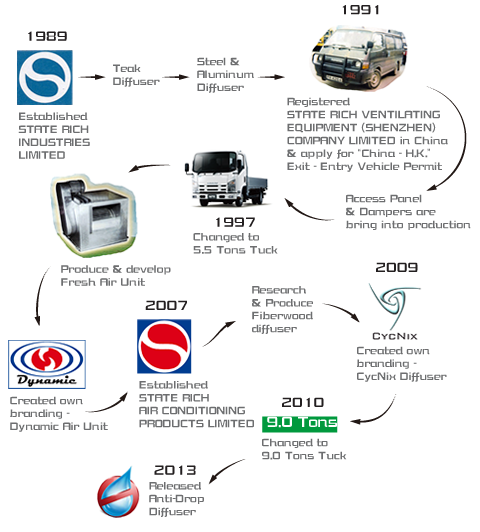 In the past 20 years, we re-developed and expanded the production line, introduced Air Handling Unit, Fire Damper, Non-return Damper…etc. All these products have reached the National Standard with the permission of production. On the other hands, our products have been supplied to some shopping mall and residence such as Olympian City, Royal Peninsula, Hotel Nikko Hong Kong, Shangri-la Hotel, InterContinental Hotel, and some restaurant, for example, Star Seafood, Lei Garden, Fu Lum, Fairwood, Cafe de Coral, Maxims, Genki Sushi, Tusi Wah…etc. However, our products have been adopted not only in Hong Kong, but also in Guangdong, Macao or even everywhere in China.